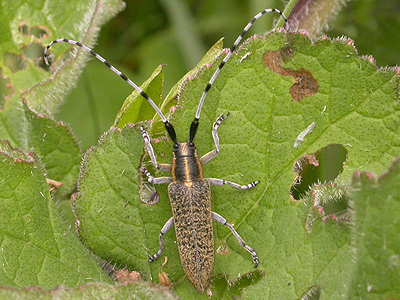 Among some of the most impressive Nottinghamshire beetles, are longhorn beetles. 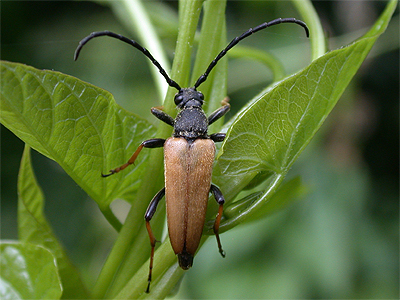 Longhorn beetles belong to the family Cerambycidae. There are currently 67 UK species, including some accidental imports. 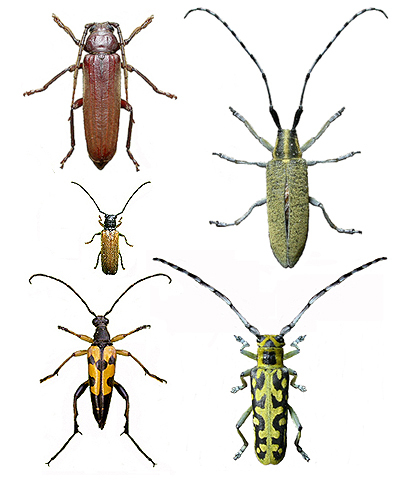 Several species are common and easily noticed due to their bright colouration. 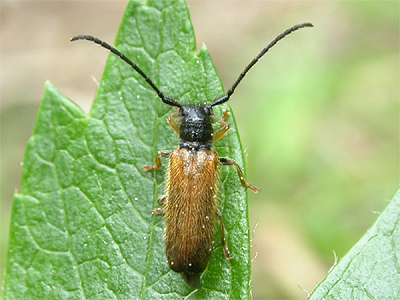 Most species can be distinguished by their conspicuously long antennae which gives rise to the longhorn name. 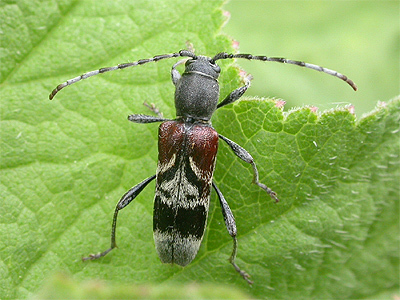 They are typically long bodied and long legged beetles. 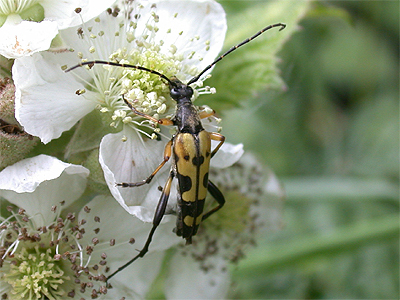 They also show a large size range and most are active by day, when the adults generally feed on nectar and often visit the flowers of Hawthorn, Dogwood and Umbellifers along woodland rides. 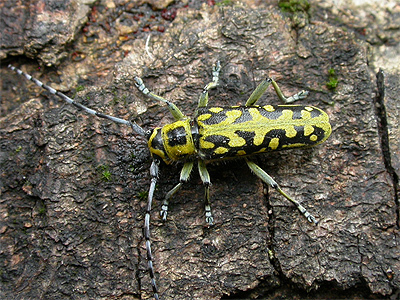 Longhorn larvae feed within the timber of woody plants (including that which is dead or decaying) and several species are considered pests of coniferous plantations. 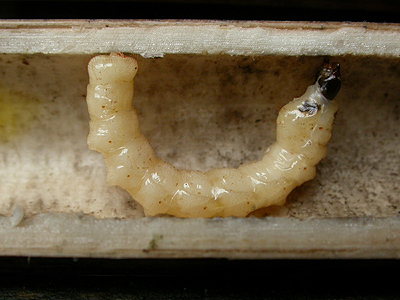 Larvae are also sometimes imported from abroad within loads of timber. 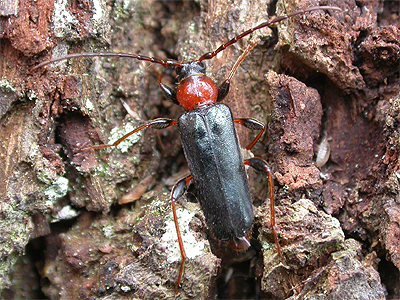 In the Sherwood Forest area, longhorn beetles are regularly encountered during the Summer months. 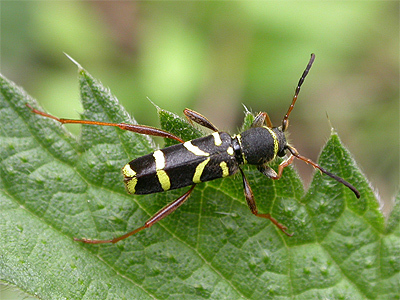 Leptura quadrifasciata, Rutpela maculata and Clytus arietis are perhaps the most regularly recorded species. The real 'jewel in the crown' has to be Saperda scalaris. It is a rare species both locally and nationally and currently holds Nationally Scarce Grade A status, meaning it has only been recorded from 16-30 10km squares since 1980. 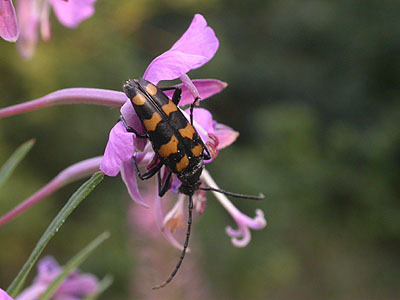 Saperda scalaris is a visually stunning beetle, but many of our longhorns are attractively marked. 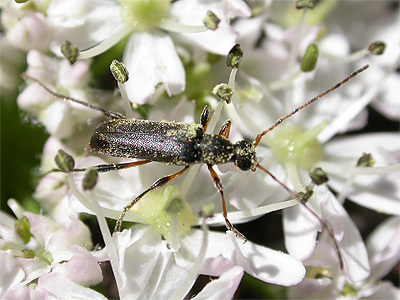 The following list of scarce Cerambycidae have been recorded from the county, but Nottinghamshire has plenty of potential for adding new longhorns to the county species list. 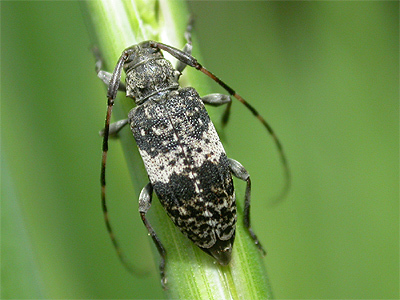 Acanthocinus aedilis Nb, Anaglyptus mysticus Nb, Aromia moschata Nb, Gracilia minuta pRDB2, Grammoptera abdominalis Na, Paracorymbia fulva RDB3, Poecilium alni Nb, Phytoecia cylindrica Nb, Prionus coriarius Na, Saperda carcharias Na, Saperda scalaris Na, Stenostola dubia Nb and Stictoplura scutellata Na. Source:- Nottinghamshire Local Biodiversity Action Plan - Appendix A: List of species of conservation concern in Nottinghamshire. S.Wright. 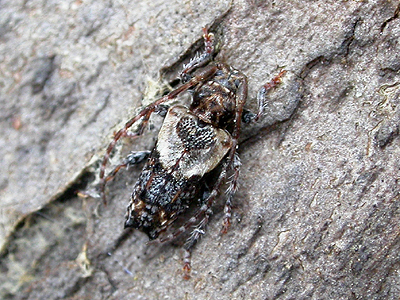 Left:- Full grown larva of Agapanthia villosoviridescens found at the base of a hollow stem of Hogweed at Sherwood Forest CP in December 2010. It was subsequently bred through for identification purposes and emerged in late January 2011. 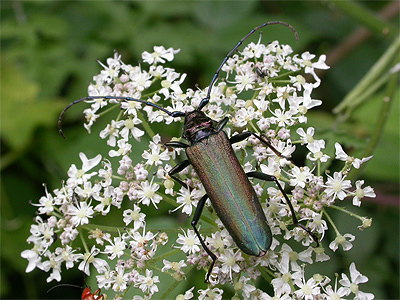 The Cerambycidae contain some of our largest beetles, with the Musk Beetle (Aromia moschata) being our largest by far. It's size really is impressive when first seen and the only other longhorn to come close in the size race, is largely nocturnal in it's habits. 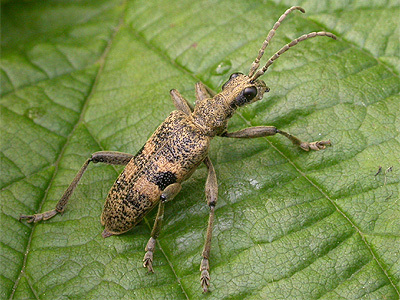 Arhopalus rusticus is a chestnut brown longhorn, but more impressive in its size rather than colouration. 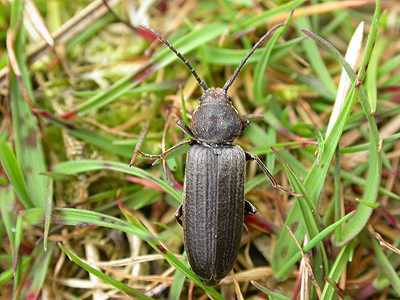 The only easy way to see this beetle, is by luring them in with an MV light, but it seems a widespread species in Nottinghamshire, especially in woodland dominated by Pine. 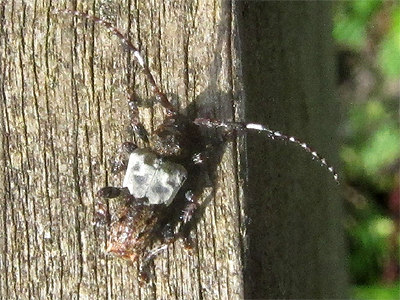 Correct identification of most species is relatively straight-forward, although, as with all insects, some degree of care has to be taken, pretty much all the species likely to be found in Nottinghamshire can be easily identified from photographs. 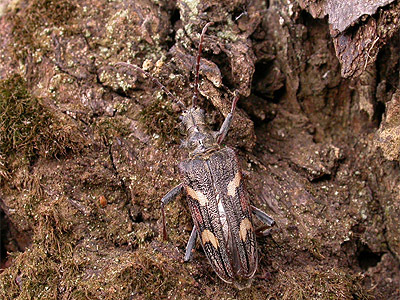 Longhorn beetles are beetles of the Spring and Summer months and are often to be seen visiting flowers, but searching log piles in sunny situations is another productive method. There are now a total of 20 species illustrated. 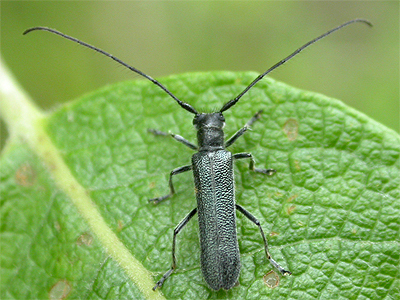 Several of these seem to be common and can be found in or around most Nottinghamshire woodlands. 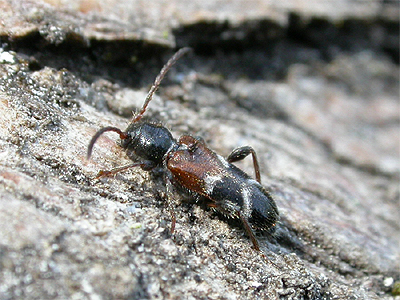 There are a few though, which we have only found within the Sherwood Forest area and there are several more species which we have yet to come across and photograph. A.G. Duff. Checklist of Beetles of the British Isles, 2008 edition. 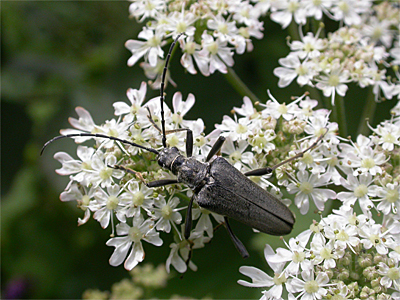 The Cerambycidae represent some of Nottinghamshire's most impressive beetles. 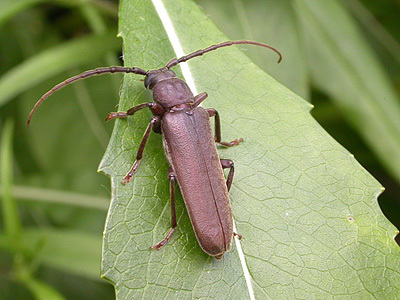 Commonly known as Longhorn Beetles, there are nearly 70 known UK species, including some accidental imports. 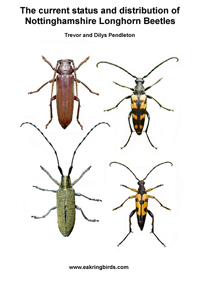 This now out of date pdf version of the Atlas, produces up to date distribution maps of all the Longhorn beetles recorded in the county over recent years, but does list all the species we can trace as having been recorded in the county.